Alright guys, looks like it is ON!!!! 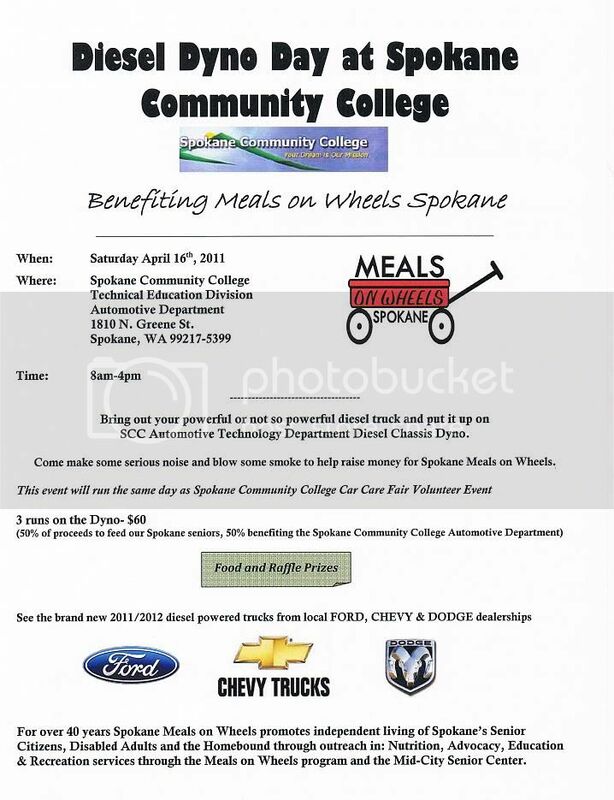 April 16th at Spokane Community College. This will be fund raiser like i said for Meals on Wheels. Hoping to get some of the Dyno fees donated, along with some food donations from local businesses, etc. We will try and have some news media there to cover it, etc. More details to come, so mark your calenders and spread the word. I want this to be the biggest dyno Day Spokane has seen!!! Cost of the Dyno will be $60 per truck for 3 runs, with half of the each fee going to Meals on Wheels and the other half going to the Automotive department at the College. Also, trying to get some local diesel shop to donate something so we can raffle them off with the proceeds going to Meals on Wheels also. That is very cool man. Ill spread the word abd try to come. im posting it for a friend, im going to try to make it up and see what my new injectors will do. Since when is Spokane in Oregon? just trying to get more people to show up. maybe if Ken posted up in it they would show up. he posted it in the event section along time before i posted it here.